Snack Girl KNOWS about the broccoli haters of the world. And she wants to change their minds. There are 2 keys to getting people to like broccoli. The freshness of the broccoli. Creating a sauce no human would dislike. Let me be very clear. Old broccoli tastes terrible. Yucky, stinky, and awful this stuff should be fed to a gerbil not a person. BUT, fresh broccoli? Heaven! Broccoli that is cooked correctly (not too long) will be sweet and crunchy. You can tell it is fresh at the store by the tightness of the florets and that great green color. It if feels soft, don't buy it. And, one serving includes 225% of your daily value of Vitamin C, and 8% of your daily value of Calcium and Iron. Do NOT give up on broccoli. So, how to you get kids and picky adults to eat broccoli? Use peanut butter. I know it sounds crazy, but it works. The sauce below is a take on a Thai peanut sauce that you would find with a satay. The key to making it palatable for everyone might be to leave out the spicier components (garlic and ginger powder). For children, this recipe can be a lot of fun because they can make the sauce themselves. My 6 year old can now measure out tablespoons of liquid and had a great time stirring this sauce. I had her taste it before we added the garlic and ginger. SHE decided to add in the spicier components and ate about 1/2 pound of broccoli with zero prompting from me (hurray!). This is also a great party snack, and is gluten-free, fast to make, and really delicious. You can join in the Frigidaire Kids' Cooking Academy to get great recipes, how-to videos and tips, all designed to help involve kids in the kitchen. See: Make Time For Change. Do you like broccoli? What's your favorite way of eating it? Separate broccoli into stems and florets. Peel and chop stems. Steam broccoli in a steamer over boiling water for 3 to 5 minutes (or your favorite way to cook broccoli). Mix peanut butter, rice vinegar, soy sauce, sugar, minced garlic, and ginger in a small bowl. If you keep your peanut butter in the refrigerator, you will probably need to heat it for 30 seconds to get it to mix with the other liquids. Stir vigorously until combined. 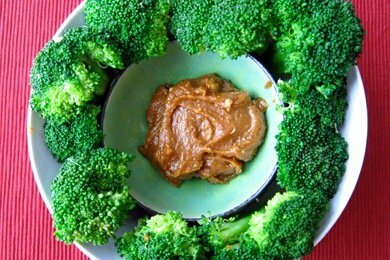 Serve broccoli with peanut sauce in small bowl on the side. Enjoy! I love broccoli! This sauce sounds awesome, and probably way better for you than the Cheese Whiz my parents used to get me to eat it. Now I can't get enough of it. I like it roasted or sauteed with mushrooms. I love broccoli too. I like this idea. My son will eat fresh broccoli with dip (I know not the best, but if he will eat practically a veggie tray with dill dip I can live with it). I also get Schwan's micro steam broccoli which is tasty and the kids love it with lemon on it. For those of us with kids allergic to peanuts, anyone know if sesame butter would work the same way in this recipe? My daughter says she doesn't like the flavor of sesame butter, but I think it's psychological and I'm not gong to stop trying to get her to like brocolli or sesame butter! I'm a big fan of broccoli! Normally I like it steamed and topped with nutritional yeast flakes. I adore nut butters but I've never liked peanut sauce... however, I do have all of the ingredients for this sauce in my house, so maybe I'll give it a shot! I usually have frozen broccoli in my house rather than raw - do you think this sauce could be poured over steamed broccoli? @Sagan - It is more of a dipping sauce than a pouring sauce. But you could heat it up and add a little water to thin it out and it would pour. You probably should double the sauce recipe to be sure you have enough. Great idea! I can't eat peanut butter, but I'll make this with almond butter. Sounds delicious! I love peanut sauce. As far as how to eat broccoli? I like to toss it with a little olive oil, sprinkle it with salt and pepper and a little parmesan cheese and roast it at 450. Keep an eye on it, though, or the cheese will burn. Of course, you can always toss the cheese on afterwards, but it's pretty tasty when it's toasted along with the broccoli. This sauce sounds delicious! I love broccoli anyway, but I also love peanut sauces in Thai foods. Can't wait to try it. Thanks! Question though, i'm rural & budgety, so was wondering what could be substituted for the rice wine vinegar? frozen vegetables are fresher than "fresh", because they're frozen when they are harvested, they retain their nutrients better than the produce that has been sitting around. I LOVE broccoli; it's been in my top 5 since I was a kid. Usually, I just steam it with a little splash of lemon juice, or occasionally toss it in with pasta (like here: http://www.woodenspoonblog.com/2011/01/05/broccolini-and-spinach-pasta/), but I can't wait to try this! Looks fantastic! What a yummy way to enjoy broccoli! I have never thought of serving broccoli and peanut butter together, but this sounds deliciously amazing! I really like this recipe, getting little ones to eat green vegetables can prove difficult. (Especially when my son only associates green with Tractors... haha!) I love to make a Broccoli Cheese Soup though, using fresh broccoli. And that is one way I can get my little guy to actually eat it! Congrats on making the Top 9 today! THANK YOU! I adore broccoli, but my husband won't touch it. He loves peanut sauce, and it's easy enough that if he still turns up his nose, at least I get to have some! Yay! Stir Fry with Peanut Sauce is one of my 2 and 4-year-olds all time favorite meals but I never thought of just giving them broccoli with a peanut dipping sauce. They eat the broccoli no problem in the stir-fry but they always comment on it and say they "don't like it". Maybe holding it and choosing to dip it will get them over the idea that they don't like it. Personally as long as they are eating it that's all I really care about but it's worth a try. It freezes really well so I usually make a quadruple batch and then freeze the leftovers in 1/2 cup servings. It makes for a great throw together meal served over cooked pasta or in stir-fry. Just FYI, unless you use Tamari in lieu of soy sauce, this recipe isn't gluten free. Soy sauce has wheat. Just thought anyone that needs GF would like to know that. You can usually find Tamari in same area that carries soy sauces in your grocery store. Can't wait to try it. Sounds delicious!! Thanks for the recipe, if broccoli is a little limp you cut it andvputvit in water and it will firm up again.